Yesterday’s bicentennial colloquium on “The Evolving Bargain between Research Universities and Society”--organized by Paul Courant and Sue Alcock as part of the University of Michigan’s bicentennial celebrations--engaged the leaders of nine prestigious national and international universities in a topical conversation about the role of research universities now, and in the future, as servants and critics of society. 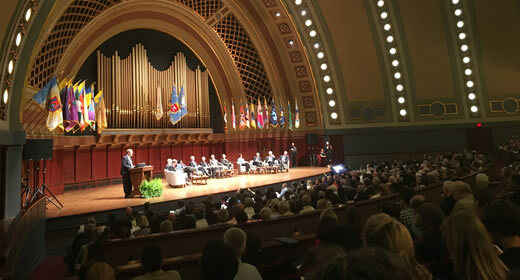 The panelists--including Sir Leszek Borysiewicz, vice chancellor of the University of Cambridge; Drew Gilpin Faust, president of Harvard University; Louise Richardson, vice chancellor of the University of Oxford, and others--are all members of the board of the Tanner Lectures on Human Values. Together, they gathered to discuss timely challenges facing distinguished research universities. Among them, how today's research universities protect and foster free and open discourse, how they communicate their value to an increasingly skeptical and critical society, and how they work to serve as engines of social mobility.